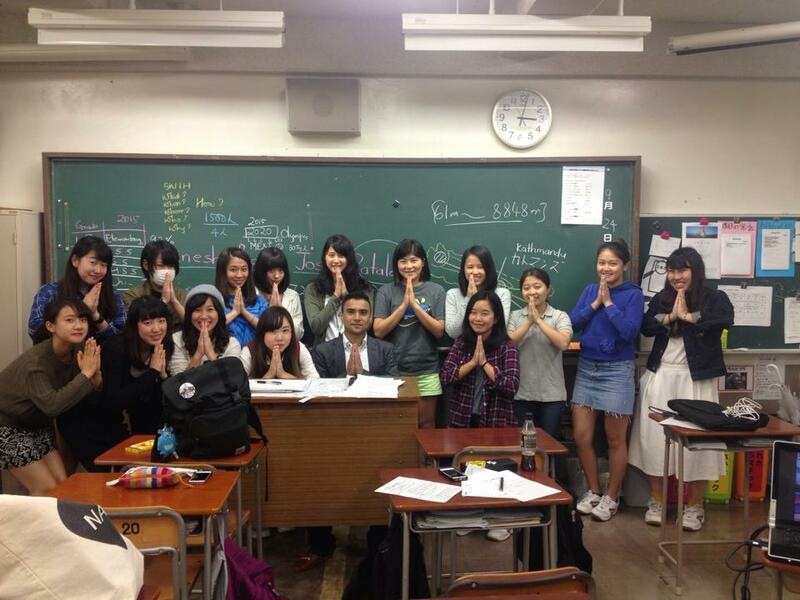 Upon the invitation of Hideki Kitayama, a teacher at Wako Senior High School, I (Joshi) had a pleasure to speak to High School seniors about Nepal, social concerns and the impacts of Great Earthquake 2015. It was an elective class named “The races and cultures in the world” in which students pick up several global issues, research about their background, discuss the problems and debate about the solutions. For the second term of the course, Nepal was chosen as the country for case study. The students had researched about Nepal beforehand so as to acquaint themselves with the basic understanding. For my presentation, I picked up both positive and negative sides of Nepal with the use of a lot of pictures. The intention was to make students understand that Nepal is a country with some problems but with a lot of opportunity. The students carefully listened to the talk. I was very happy to respond to their questions on social issues like caste system, early marriage, and youth migration during the question and answer session. What I was impressed the most about students was with their sentiments seeing the pictures of devastated Nepal in the wake of the recent disaster. I believe one of the important characteristics of a truly global citizen is regard other countries’ problems as their own. In reference to this notion, I found the students eager to explore more about global society. A few students came and talked to me personally after the class. They showed their willingness to visit Nepal one time in their lives. Some even stated their strong desire to conduct research about Nepalese issues during their advanced studies. What could make you much happier than this? To this end, I thought I was able to serve my purpose. My hope is that these students continue their search allocating a certain portion of their heart for Nepal and Nepalese people even in the days to come. ©Copyright2018 YouMe Nepal.All Rights Reserved.